Celebrated in Hindu mythology and religion, the Garhwal Himalayas are said to be the "Abode of the Gods". 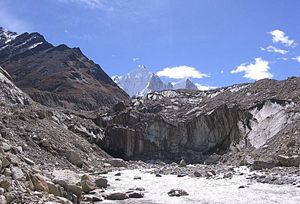 The river Ganges takes its source in this remote massif, at the sacred shrine of Gangotri, and rushes down to the plains in a torrential fury. Very few trekkers follow this itinerary which will lead to one of the most important spots of Hindu spirituality, where you will experience a strange atmosphere of religious fervour. From Kedarnath, where hundreds of pilgrims arrive from all regions of India, the path proceeds at first along the sacred Bhagirathi river, then through dense forests and grassy areas as far as Lata. From there it is a 5 hour drive to Gangotri, where the second part of the trek starts. Near Gaumukh, close to the Source of the Ganges, you will experience the strange view of half-naked sadhus in the lotus position, meditating on the bank of the bubbling stream pouring out the glacier. Further up, Tapovan is a grassy area with numerous brooks, surrounded by snowy peaks. It is a round-trip itinerary starting in Kedarnath, along the sacred Bhagirathi river, then heading west, through dense forests and grassy areas. The northern part of the itinerary will offer magnificent views of several high altitude lakes. Where you will be met and transferred to your hotel. (Hotel B&B). Day 02: Delhi - Haridwar - Rishikesh by bus (5h). We will go on a sightseeing tour of Haridwar, which is an important pilgrimage place. Day 03: Haridwar - Gaurikund (2000m) by bus (9h). Day 04: Gaurikund - Kedarnath (3600m) in 6h. This is a steep climb where we will walk with hundreds of pilgrims from all over India. The forest slowly gives way to splendid views of Mount Kedarnath (6940m). Kedarnath is one of the most important Indian pilgrimage places. The temple, built in the 8th century and dedicated to the goddess Shiva, is magnificently surrounded with snow-capped peaks. Day 06: Kedarnath - Gaurikund in 4h. Day 07: Gaurikund - Maggu (3050m) in 6h. After a 4-km drive to Sonprayag, we trek upwards through dense forest. Day 08: Maggu - Panwali Kantha (3150m) in 5h. After a short climb, we follow a pleasant trail over a flat area, and descend towards the meadows of Panwali Kantha. Day 09: Panwali Kantha - Ghuttu (1600m) in 6h. We climb up to Khinko La (3500m), then descend through a magnificent tropical forest and rice-fields. Day 10: Ghuttu - Baghi Chatti (2600m) in 5h. We continue our way through forest and rice-fields to a ridge trail. From the top, the view towards Mount Garhwal is quite impressive. Day 11: Baghi Chatti - Budhakedar (1530m) in 4h. An easy day, all-downward, through fields and forests. Day 12: Budakedar - Belak Khal (2750m) in 6h. The trail passes through a succession of tiny villages: Agund, Jhala and Pangrana. Magnificent high-alpine panorama. Day 13: Belak Khal - Lata (1700m) in 3h - Gangotri (3050m) by bus (5h). We descend towards Bhagirathi, one of the Gange's tributaries. Afterwards, we drive the 80 km to Gangotri, a famous place of pilgrimage. Day 14: Gangotri - Bhojbasa (3800m) in 5h. We progress along a picturesque trail, congested with porters, mules, pilgrims and mobile traders. From Raj Ghat, the glacial valley-of-flowers-trek.html gets wider, and soon we can see the Bhagirathi massif, which rises above 6500m. Day 15: Bhojbasa - Gaumukh (3900m) - Tapovan (4450m) in 4h. From Gaumukh, source of the Ganges, the scenery is fascinating, with praying pilgrims and half-naked sadhus meditating along the banks of the tumultuous stream that pours out of the glacier. The trail crosses Gangotri moraines before reaching Tapovan and its gorgeous meadows, furrowed with streams and scattered with flowers. From here the panoramic view over Shivling (6540m), Meru (6660m) and the Bhagirathi massifs (above 6500m) is stunning. It is not surprising that sadhus chose this area to meditate in summer time. Day 16: Tapovan - Bhojbasa in 3h. In the morning, we lazily enjoy the charms of this magic spot. In the afternoon we descend towards Bhojbasa. Day 17: Bhojbasa - Gangotri in 4h. We visit temples of Gangotri in the afternoon. Day 18: Gangotri - Uttarkashi (bus) in 6h. Day 21: Transfer to airport and fly back home.